I may have already mentioned that my daughter's softball season is in full swing? 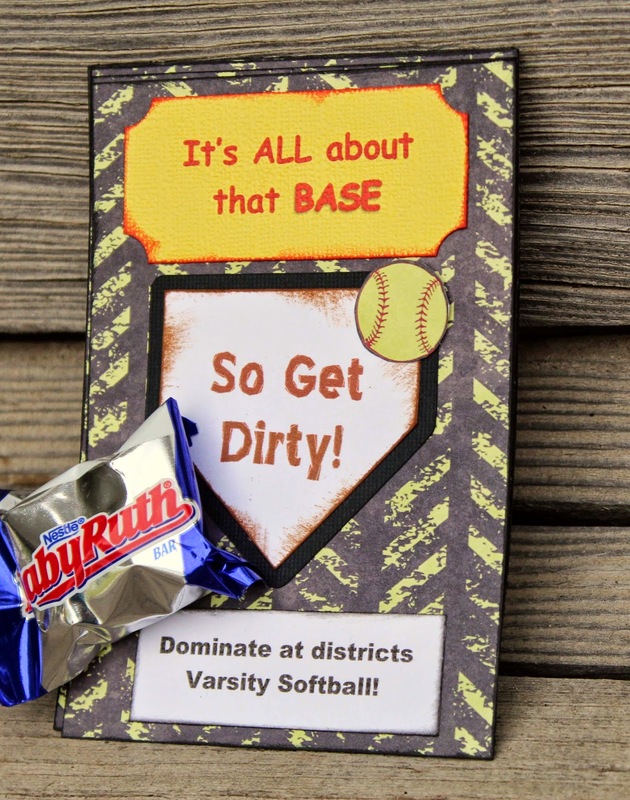 Well, we just decorated their lockers for districts and I wanted to share with you the little "encouragement" I added to the great mix of decorations from all the Moms. I used the awesome Fast Pitch line, of course. Specifically the back side of the cutouts page. 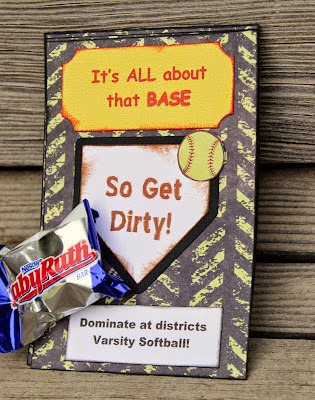 From the moment I saw that stitch print I knew I wanted to use it to do something fun for my daughter and her teammates. So I used my computer and some yellow doodlebug cardstock to create the top portion, then designed my own home plate on my silhouette and cut it from some plain white cardstock and then, slightly larger, from some black cardstock. I ran the white plates through my printer to add the rest of the quote and then added ink and some fussy cut softballs from the front side of the cutouts page. 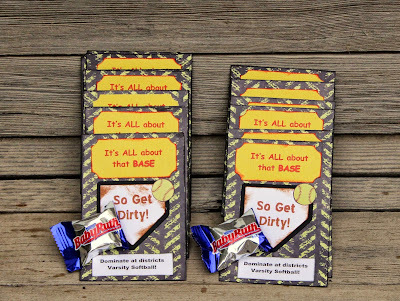 I made a total of 15 and added some little Baby Ruth candy bars to all of them. 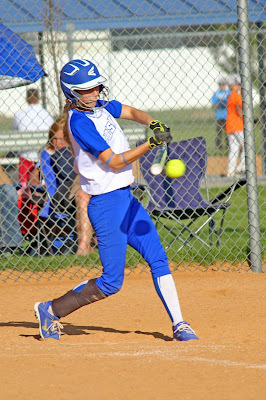 And here's a photo of my girl doing what she loves! We have a fun Holiday challenge going on! Find it here. Sometimes memories are so special that they require more than one page to tell the full story. Prom is certainly one of those times! It's a time where every little lady gets to be a princess. Vicki had pre-prom photos taken of her dress and the photographer had a great time playing with her unique style. Tamara Fischer of Something Photography keyed in on Vicki's Converse Allstars and used them to transform Vicki into a 21st century Cinderella. I used Moxxie's Night to Remember to capture this beautiful moment. I used rub ons from the Night to Remember collection as my journalling. For a little more bling, I added sequins to the stars. As an additional decorative touch, I included an up and coming trend - fringe! The tassels are made from embossing thread folded over a small bit of jewelry wire and anchored with brads. I love the motion and life that the tassels add to the layout. To learn about this and other up coming trends, head on over to the show notes for episode 42 of the Scrap Owl Podcast. So, what do you think? Loving the tassels? Loving the layout? I'd LOVE to hear your thoughts! Let us know in the comments below. My boys are growing up and it is so apparent when I scrap pages from a few years ago (Is any scrapper ever caught up?!?). Here is my baby on his first day of Kindergarten. I used a combination of the current BRAINIAC School Moxxie line with the earlier School Zone Moxxie line. I adore how the colors are the same so they mix and match perfectly. They took a great line and built on it to make it fuller. 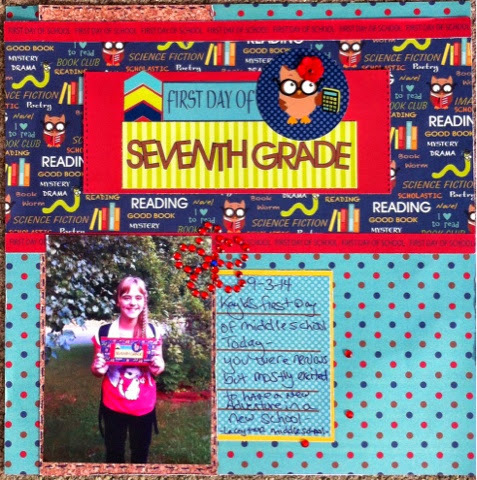 I used the School Zone "Eleventh" for the background and Brainiac "Make the Grade," "Bookworm," and "Brainiac Stickers." 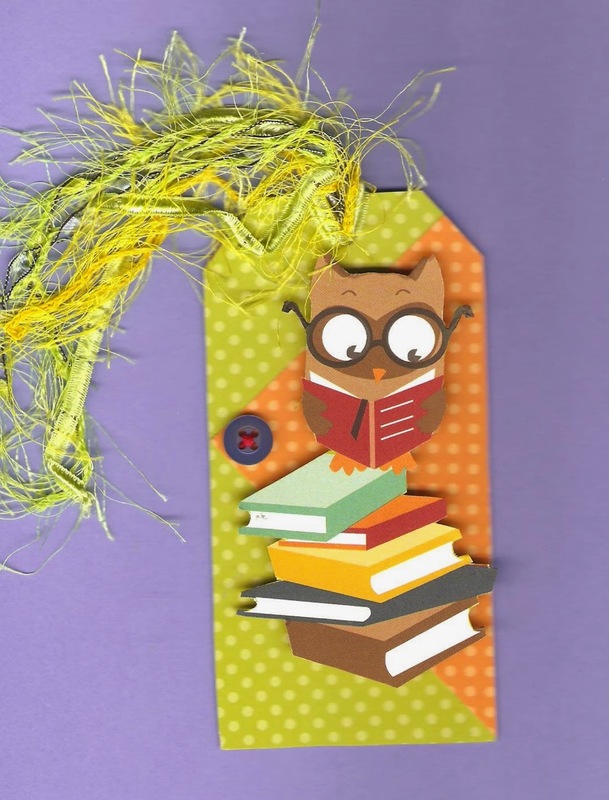 And see that cute owl die cut? That was a RAK from Design Team member Renee Robbins. So cute! Now let's see your school pics cropped with a MOXXIE school line! Check out our latest challenge and enter to WIN here. I used pocket page protectors from American Crafts that I picked up at my local scrapbook store as the template for my layout. Then I pulled apart elements from the Moxxie Brainiac collection. Since the Moxxie Brainiac collection features cutouts, deciding on the right pieces for the smaller squares was easy. And, since that little owl is just too darn cute, there wasn't a ton of embellishment needed. I dressed up my photos a bit, though. I used elements from the Moxxie Brainiac Cardstock Sticker sheet to add some captions to my photos. I also used rub ons from the Moxxie School Zone collection. These two collections were designed with the same colors and some of the same features, so they work perfectly together. My pocket page template has a large rectangle in the middle of the page that served as a perfect area to showcase my children's artwork. After all, it can only hang on the fridge for so long, right?!? Again, I teamed up the Moxxie Brainiac and Moxxie School Zone collections to create a bright and eye catching backdrop for my masterpieces. The only element that doesn't come from Moxxie is that little strip of washi tape, and of course, my children's amazing creations. 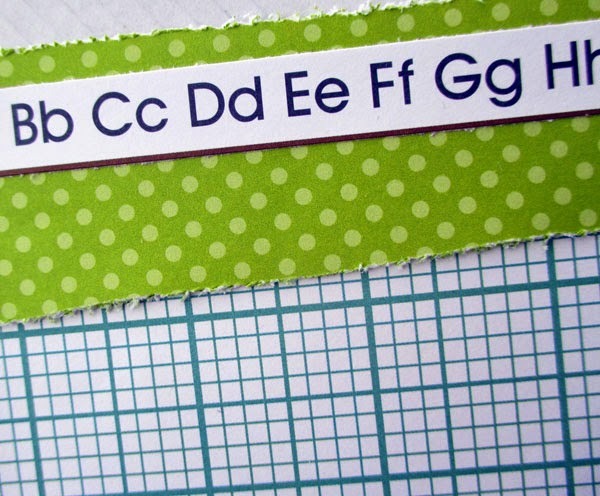 The Moxxie Brainiac Mathlete patterned paper was the perfect place for a handwritten subtitle. That chalkboard paper design looks just like the real thing. And, when you pair it with a white pen, it's just like having a chalkboard right on your layout! Hope you like the layout as much as I do, and that it gets your scrappy wheels a turning!! Hi all, jen t. here. I am stopping by to share a couple of fun and fast pages i made using the brainiac collection. 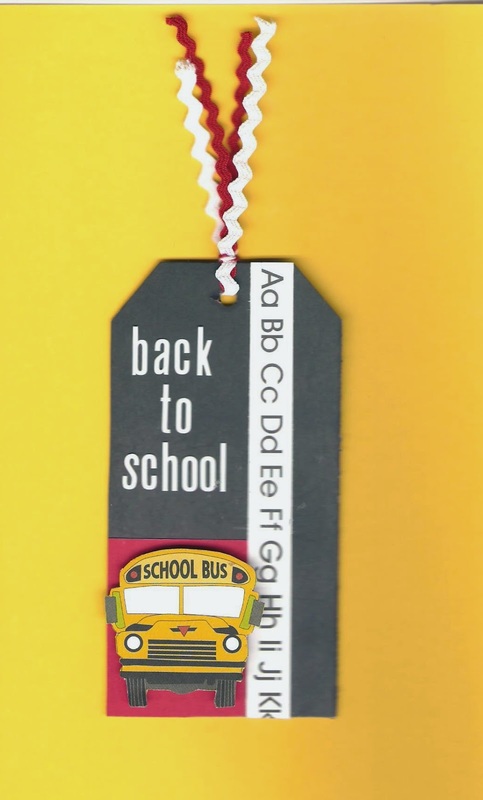 Do you remember the back to school signs i made for my kids? Well, i got the pictures developed and thought how fun would it be to put the sign and their pic on a page together! So i layered some coordinating paper and matted the picture then layed the sign on top. I then, added a journaling card from the cutouts on each page and added some doodles and gems/pearls to give them a finishing touch. I really love how they turned out! I think i am going to start making them every year:) thanks for stopping by and happy creating!!! When she was in high school my niece played volleyball. This page shows Karen after a game, smiling and happy because her team won. I used Moxxie's new Volleyball line for this page. I began with the Ace Serve paper for the background and layered it to a piece of black cardstock. Next, I cut a photo mat from the Volleyball Rules paper. Then I punched the volleyball from the Volleyball Cutouts paper. A scallop circle was punched from the B side of Ace Serve. They were layered behind the photo. A small white doily was then added behind the photo mat. 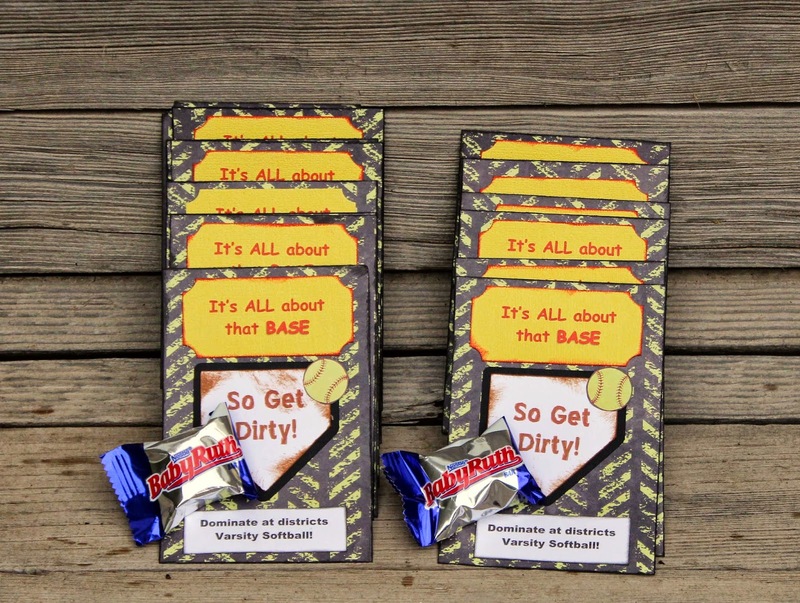 Lastly, I added cardstock stickers and the "Volleyball" word strip from Volleyball Cutouts. The title, "After The Game", is made using the new black alphabet stickers. This new Volleyball line is great! 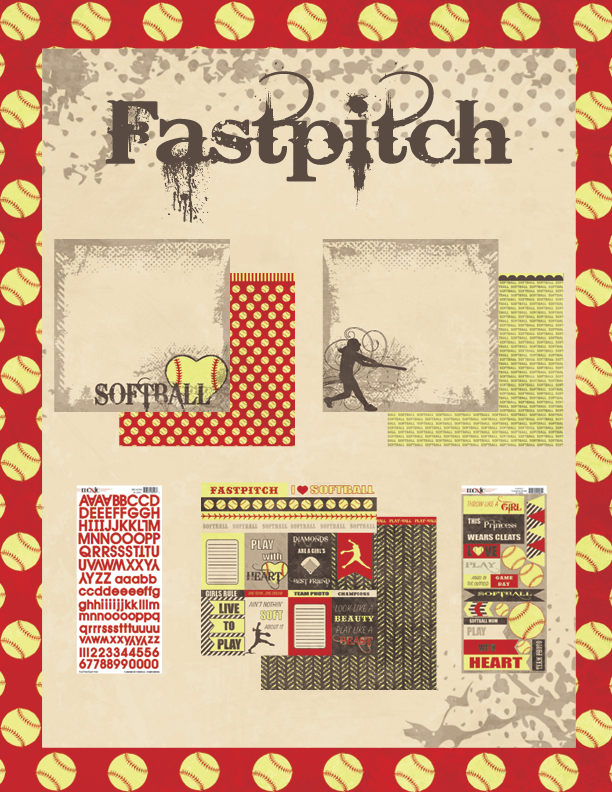 It has fun patterned papers, cool stickers and cutouts and you will love using it to create pages about your own volleyball player! Don't miss our Halloween inspiration and your chance to WIN here! Hi All! Renee Robbins back from Scrap Owl with a smart little layout featuring the new Moxxie Brainiac collection. I pulled this layout together to showcase my little man's first day of school this year. (Isn't he just an amazing little guy!?!) We even took a little "selphie" before he made is way in. 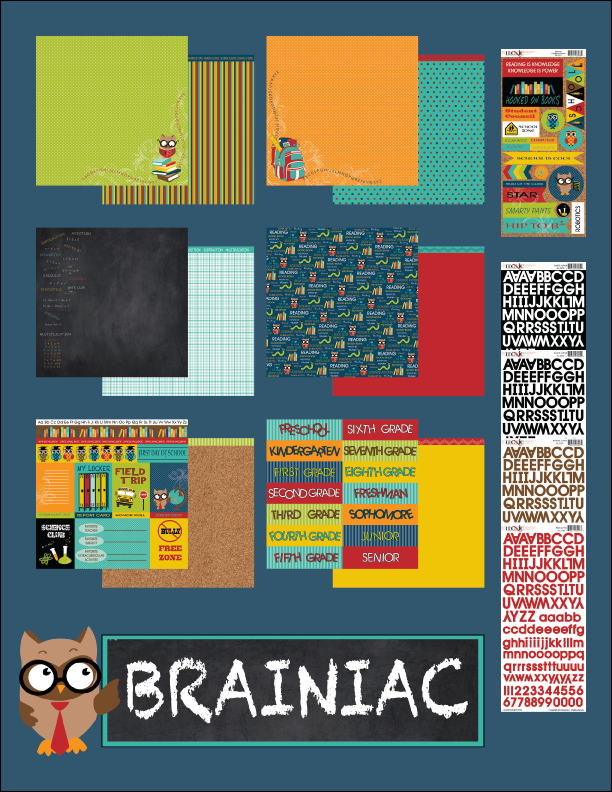 The Moxxie Brainiac collection is an amazing theme line for all your school needs. Over the last few weeks we've already been amassing piles of "school projects" that my little guy has created during his time in preschool, and I've been using the Moxxie Brainiac collection to give some of our favorite pieces a permanent home in his scrapbook. 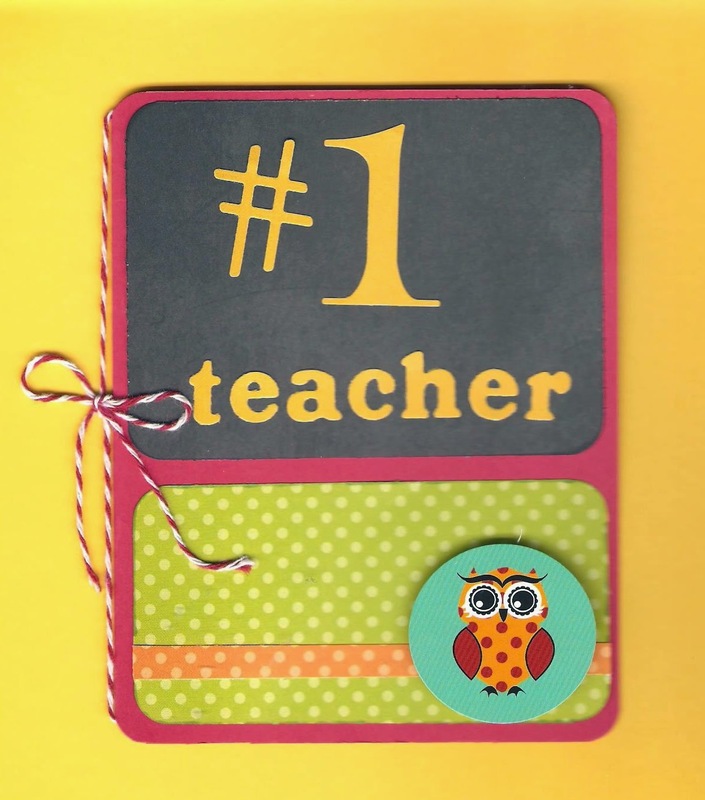 For this layout I also included the large circle sticker from the Moxxie School Zone #2 Cardstock Sticker set. The Moxxie School Zone line and the Moxxie Brainiac collection use many of the same colors and even some similar elements so it's easy to combine the two together. 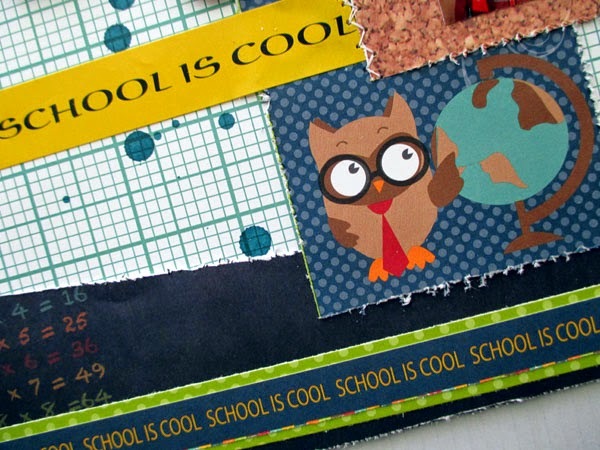 Actually, the orange piece sandwiched in the middle of all the layers is Moxxie School Zone Second patterned paper! Hope you like the layout and are inspired to get your own school days memories scrapped! Come to think of it, that's your homework! Head out and get your school pictures scrapped using one of Moxxie's lines then enter it in our blog hop giveaway for your chance to win the Moxxie Autumn Glory collection. Check out the details at http://gotmoxxie.typepad.com/got_moxxie/2014/09/moxxie-fall-blog-hop-challenge.html. Hi Moxxie Fans! 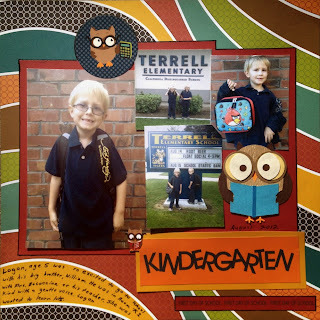 It's Renee from Scrap Owl taking over the blog today. For this post I thought it would be fun to take a look at how I create embellishment clusters on my layouts. If you are unfamiliar with that term, an embellishment cluster is simply a variety of embellishments, layered upon each other in order to create one large "cluster" that acts as a single embellishment. This helps you add dimension and eye catching detail to your pages, while still being able to use the "rule of three" to balance your layout. 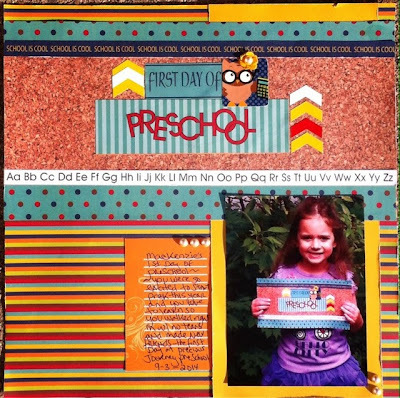 In this first version of my layout I have already placed the pictures and layered patterned paper from Moxxie's brand new Braniac line and elements from Moxxie's other school collection, School Zone. These are the foundations of my three embellishment clusters. The first cluster is the "title cluster". This includes the "Preschool Dance" title, the stamped image, the CD rub ons, the arrow, and the green striped patterned paper pieces. I've layered some of these pieces directly on top of each other, but the arrow was popped up using foam tape. The second cluster is the journaling cluster located below the single picture on the left side of the page. This cluster includes a small amount of journaling on the green striped paper, but also has the same stamped image and a cut out of the same CD used in the title cluster but punched out using my Epiphany Crafts bubble cap maker. The bubble cap is sitting on a button sticker from Moxxie's School Zone cardstock sticker sheet. The final cluster is the located between the two photos on the right side of the layout. This forms a triangle between the two other embellishment clusters - working with the rule of three. Again, I used the same stamp and CD design, but I added the arrows to coordinate with the journaling. As I continued to build my embellishment clusters, I added banners I cut from vellum with an old Creative Memories border punch. On the banners I adhered small sequins for additional bling and dimension. The key to embellishment clusters is not to be worried about overlapping elements. As you can see, some of the banners are tucked behind photos while others are on top of the foundation elements. This is the final layout. I added some additional rub ons with the stars and added larger sequins to the right side photos. Again, note the placement of the stars and the sequins. The three stars make a triangle and the three larger sequins make a triangle. This is a great way to help determine balance when you are layering a number of different elements together. The dance was so much fun! A little crazy with 40 preschoolers running around to the loud music, but it was a blast. And, I think my layout captures that feeling exactly! I hope you like it! Don't forget to check our giveaway HERE. One thing I LOVE to scrap is the first day of school. My kids know I'm going to take a ton of photos of them before school, and kinda groan a bit, but I know they do love it. Well both my older kids are in the middle school this year, so that makes it kinda fun. I have completely fallen in love with the Brainiac collection, and couldn't wait to tear into it. I literally printed these pictures off after the kids were at school and the page was completed by the time they got home. I'm a total sucker for anything owl, so these little guys in the collection are the perfect accent. 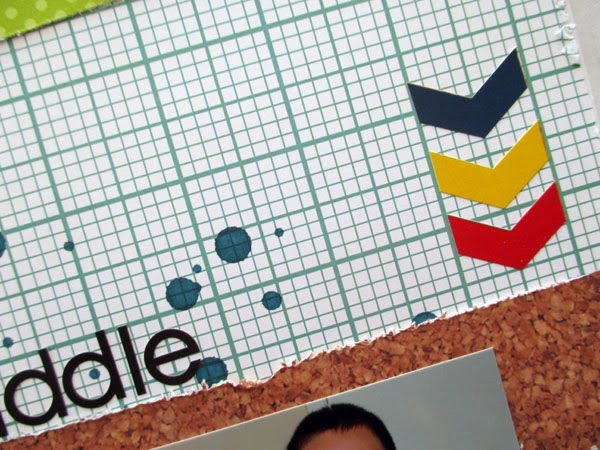 The arrow sticker accents are perfect to add onto any page or project. So break out those school pictures, whether it's the first day, the last day, any school related activities, or projects, this collection works for it all!!! items using the Amazing New Brainiac line.